Last year, Starz moved the Ash Vs Evil Dead TV show from Saturdays to Sundays. Although the new night didn’t prevent the ratings from dropping, premium cable doesn’t rely on advertising, and the show escaped cancellation. Now it’s back for a third season — and still on Sundays. Can Ash Williams’ luck hold? Will Ash Vs Evil Dead be cancelled or renewed for season four? Stay tuned. A sequel to the Evil Dead movie trilogy, Ash Vs Evil Dead stars Bruce Campbell, Lucy Lawless, Ray Santiago, Dana DeLorenzo, and B Arielle Carver-O’Neill. The Starz horror drama centers on Ash (Campbell) who is now Elk Grove, Michigan’s hometown hero. In season three, Ash finds his long-lost daughter, Brandy Barr (Carver-O’Neill), and naturally tangles with the Evil Dead. **Status update, below. For comparisons: The second season of Ash Vs Evil Dead on Starz averaged a 0.16 rating in the 18-49 demographic with 308,000 viewers. What do you think? Do you like the Ash Vs Evil Dead TV series? Should Starz have cancelled or renewed it for a fourth season? 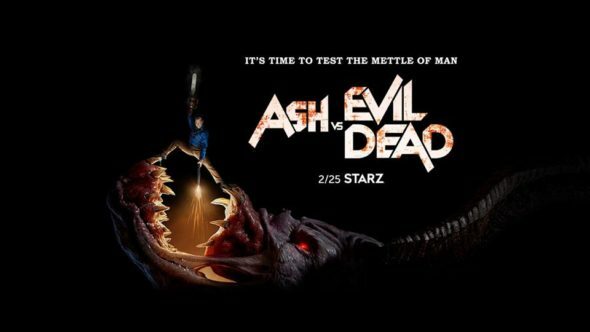 **4/20/2018 status update: Starz has cancelled the Ash Vs Evil Dead TV show, so there will be no season four. Details here. No, what’s up Starz? Why no season 4? I hate tv but I like this show. Do the right thing and renew it before you become evil dead and have to be chainsawed in half or, god forbid, decapitated. Damnit, I love this show so much but the ratings suggest it’s going to be cancelled given that Season 3 was a touch and go renewal and they’ve only fallen since then. Same here. Tell all your friends to watch, and watch again. If they have the Starz streaming app, have them stream it even if their eyes aren’t on the TV. Stream it over and over! I’ve heard a lot of good things about their Netflix viewership. They could keep it to strike a deal with a streaming service in order to attain viewership via a second party. It could also be picked up by one of the streaming services. Although that is rare it happens.